Stainless is based on the initial development of Google Chrome and uses WebKit as its engine. It paints itself as a multi-process browser, meaning each tab that is opened creates a separate process, so in theory a crash in one tab will not affect the other tabs and will not bring down the entire application. 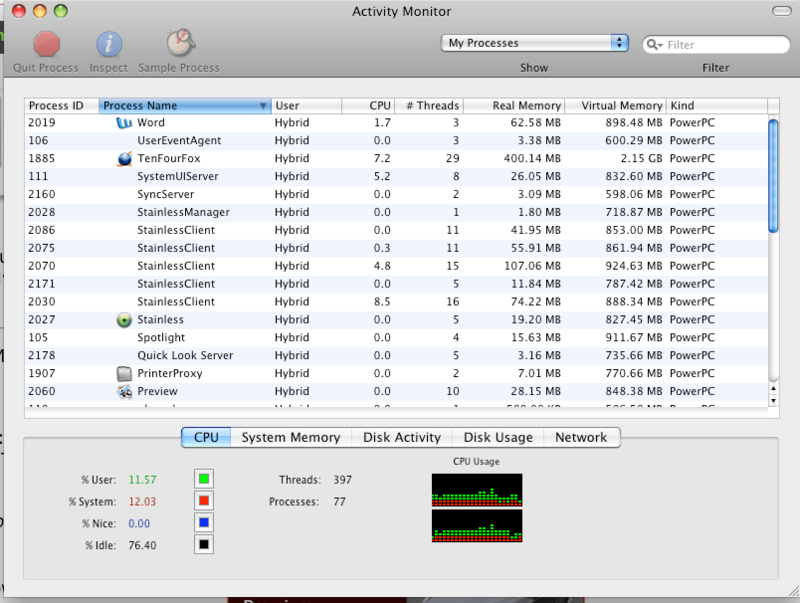 Looking at Activity Monitor, each tab opens it’s own process, and they are processor-intense on first load. According to iStat Menu 3, both my processors were engaged heavily at first. Once the application is loaded, each tab sends a different number of threads to the processors based on the amount of data on each page. Additionally, each tab (process) runs in it’s own memory space, so closing one tab will free up memory back to OS X. Stainless is very minimalist, and it was designed to be minimalist with little user customization. For example, the buttons on the top are static and unchangeable, consisting of just Back/Forward and Home. There are Preferences, but they are minimal as well. This is not a browser to customize. Bookmarks are also minimalist – they appear on the lefthand side “Bookmarks shelf”. There is no ability to import existing bookmarks, although you can see a list of bookmarks that are in Safari or Firefox and drag them to the shelf. They can be organized by right-clicking on the shelf to create folders, which you can then drag and drop the Bookmarks into. By default, they use the OS X folder icon, but you can add your own icon to the folder both during the setup of the folder, or through using it’s Properties window. I find that kind of Bookmark arrangement works against the user. Unless you customize the icon, you will have a sea of default folder and default link icons, and it is visually difficult to determine which one is which when the website does not provide the icon. Plus the shelf seems to distract from the page being loaded. This may be an individual taste, but I don’t like my bookmarks interjecting themselves visually, especially in what is billed as a minimalist browser. The good news about Bookmarks in Stainless is that they are session aware, meaning they remember if they were in Private Mode, Single Session, or in Multi-Session when you created the bookmark. Pretty cool really if you think about it – you created a Bookmark link to your favorite “ahem” site in Private Session. When you load the bookmark the next time, a Private Session will be created. I have not tested that myself, but it is touted as a feature by the developer on the source code page. Searching from the Address Bar works as expected, but there is some eye candy in the grey drop shadowing and crisp white lettering of results. That is smooth, something I wish Safari would have incorporated. Stainless has a very minimal download manager. It does not resume broken downloads, nor is there an ability to start the download over – just the ability to stop and delete the item are all you can do. This is not good if you are finding yourself having a poor connection or one that is spotty, but if your source connection is strong, resuming and restarting will not be important. What I find valuable is the “Single Session” functionality. With it, you can log into two different accounts of your favorite social media site (Facebook, Twitter, etc.). It will store the login credentials in RAM as opposed to a cookie, so when you close that tab the stored information is erased. For example, you have two Twitter accounts – one personal and one professional. Start up a Single Session, and you can have both running in separate tabs. Close the tab, and all that login information is erased. Also worth noting is Private Mode. Private Mode disables global history and page caching/storing of AutoFill information and when invoked, opens a new window. When you are in Private Mode, it will not save any usernames or passwords and will not store the page locally for quick recall. Note that every tab created in that window will also be in Private Mode. Unlike Safari, you are not prompted by a pop-up notice that you are in Private Mode, only a window with that notice will appear. I find that pop-up in Safari most annoying and welcome this more subtle notice. In Preferences, you can set Stainless to run in Single Session, Private Session, or leaving both unchecked it will use Multi-Session. That is a cool feature that other browsers should put in their browsers. This is truly anonymous browsing with no tracking and no evidence on your machine. So if you are conscious about anonymity, that is an option worth the download alone. 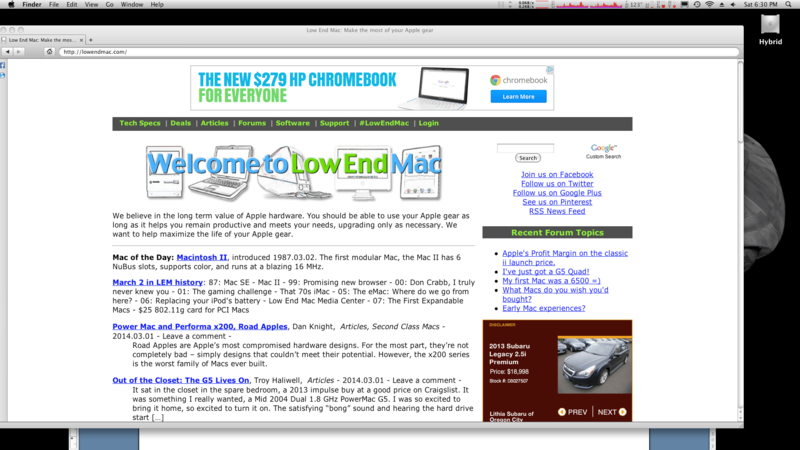 Low End Mac: Safari 5.2 seconds. Stainless 2.1 seconds. Apple.com: Safari 3.6 seconds. Stainless 3.1 seconds. Google: Tied at 1.8 seconds. YouTube: Cascada: “Evacuate the Dance Floor “ official video: Safari 5.3 seconds. Stainless 5.1. It may not seem like much speed difference on the sites with a greater amount of servers than Low End Mac, but multiply the speed by the number of sites you visit, and Stainless delivers them quicker. Plus it just feels faster – page after page loads up quicker than Safari does. The media experience on YouTube is that Stainless loads media faster and begins playback sooner. I did, however, experience some quirks: Launch more than 15 tabs and the application begins to slow down. But really, how often will the average user have more than 15 tabs? In addition, it does have a slower rendering speed with sites that use Flash heavily, although it eventually catches up. This may be a problem within my older version of WebKit. Remember, the engine in both Safari and Stainless is the same. Good: Separate processes-no more browser crashing. Quick rendering and loading, killer private functionality and single session. Bad: Download management. No resume, no restore/reload, small print in a minimalist form..
OS Support: OS X 10.5 Leopard and newer. There have been some reports that Stainless will not run in OS X 10.9 Mavericks, but I am using 10.9.2 on my Intel iMac and still run Stainless on it. So be aware that it is a download issue. Mavericks will download and unzip the file, but from there it may delete the app and move the Stainless.zip file from the Downloads folder – check Trash and Desktop. If that happens, make sure the file is not in Trash so you can manually unzip the file and install Stainless. Publisher’s note: We’re trying to get to the bottom of this issue. Troy says Stainless installed on his Intel iMac without problem, but when I tried to install it, here’s what happened: Stainless.zip downloaded and unzipped just fine, but then the Stainless app vanished and the zipped file was moved from Downloads to Trash or Desktop (I don’t recall which). We’ve asked our Facebook group for feedback on what happens when they try to install Stainless in Mavericks. I have been pleased with using TenFourFox with Tiger (10.4) on my 867 MHz Titanium G4e. I can imagine that having AltiVec acceleration from a couple G5s would be nice and a choice of browsers actively being developed. I have both on my Power Mac G5 (1.8 GHz single CPU) and like them, especially Aurorafox. That said, Stainless is a nice addition to my G5. I use iCab 5.11 regularly, TenFourFox occasionally when iCab cannot load a site, and Stainless when i don’t want all the browser overhead. Reasons I cannot make Stainless my regular browser was noted above. TenFourFox and iCab reviews may come later. I have Mac OS X 10.9.2 on my mid-2009 MacBook Pro and Stainless works fine. It’s not a fresh install, though. It’s been in my Applications folder since Leopard.